Marian Primiano (nee DeMartinis) passed away peacefully with her family at her side at SIUH on Dec. 9, 2016. She was born in Meiers Corners and moved to New Dorp, where she and her husband, John A. Primiano, raised their family. She married John in 1956 until his death in 1980. Marian attended Port Richmond High School and worked as a seamstress until she became a full-time homemaker. She was a longtime parishioner of Our Lady Queen of Peace R.C. Church and a member of the New Dorp Friendship Club. Marian enjoyed playing cards, bingo, and trips to Atlantic City. She was a member of the bowling league until well into her 70’s. Most of all, she enjoyed spending time with family, who she would do anything and everything for. Mrs. Primiano was the beloved wife of the late John A., loving mother of Barbara, John (Roseann) and Michael Primiano; cherished grandmother of Steven J. and Michael J. Primiano, and dearest sister of John Peter DeMartinis (Phyllis). 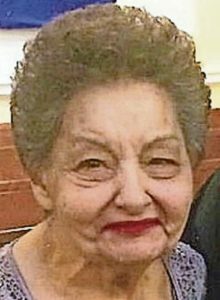 Funeral will be from Cherubini-McInerney Funeral Home (formerly Meislohn-Silvie) on Wednesday at 9:45 a.m., with a Mass at Our Lady Queen of Peace R. C. Church at 10:30 a.m.